As a renowned sports and orthopedic surgeon, Dr. Larry Lemak said he knows the great medical care he received during his battle with cancer was crucial. But the 71-year-old Mountain Brook resident and founder of Lemak Sports Medicine & Orthopedics said he credits his triumph over oral cancer to his faith, his family and his friends. Lemak, who was diagnosed with oral cancer at the base of his tongue in October 2012, is helping raise money for cancer research through the Southeastern Cancer Foundation’s annual Regional Oncology Active Research, or ROAR gala. ROAR is the volunteer fundraising committee of the Southeast Cancer Foundation. Lemak will be the honoree at the fourth annual ROAR James Bond Gala Jan. 31 at The Club in Homewood. The charity event aims to raise $1 million for cancer research. Lemak, the first physician inducted into the Alabama Sports Hall of Fame, found out he had cancer after a routine visit to his doctor. Further testing revealed that the lesion was malignant and that Lemak had stage three oral cancer–the same disease his good friend and recently retired Samford University football coach, Pat Sullivan had battled. “I was just stunned when I got the diagnosis, just stunned,” Lemak said. After the initial shock wore off, Lemak said he began putting together a treatment plan with his oncologist, Dr. James A. Bonner. Lemak underwent seven weeks of chemotherapy and radiation treatments at the University of Alabama at Birmingham. While Lemak said his medical training and years of experience as a physician helped him know what to expect during the treatment, he said his friends and other cancer patients gave him the most comfort. Lemak said he had a rough time of it as he took the chemo and radiation treatments. Lemak said as he battled cancer, he had to adjust to being on the other side of the stethoscope, so to speak. While he has always focused on building relationships with all of his patients, Lemak said his own experience as a patient showed him the importance of making sure the patients are always the top priority. Lemak said as a patient, he learned that what sick people want most is just for someone to be nice to them. Lemak said he also learned a lot about the gaps in prevention and treatment of oral cancers. “I think there needs to be more awareness about these types of cancers, and we need a comprehensive screening system because early detection is the key,” he said. According to the American Cancer Society, cancers of the tongue, tonsils, throat, gums or mouth are twice as common in men as in women. Oral cancers have been linked to tobacco and alcohol use and the human papilloma virus. Lemak said those who have never puffed a cigarette or had a beer shouldn’t think they are immune to oral cancers. Lemak said perhaps the most difficult part about battling cancer was that it took him away from work. In addition to his busy practice, which he founded in 2007 with his son, Dr. David Lemak, Lemak serves on the medical advisory boards of Pop Warner Football, USA Football and the Alabama High School Athletic Association. 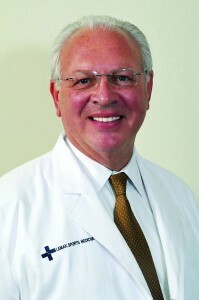 Lemak was instrumental in bringing Olympic soccer to Birmingham in 1996 and is the medical director of Major League Soccer. In 2001, he founded the Alabama Sports Foundation and the National Center for Sports Safety, which works toward preventing injuries in young athletes. Additionally, he and his son, David, are the team physicians for 18 high schools, Samford University, Miles College, Alabama State University and the University of South Florida. Lemak’s drive to do good things to help people doesn’t stop once he leaves his office. In 2012, the gala raised $500,000, which was matched dollar-for-dollar by oncology physicians at UAB and parlayed into a $17 million federal research grant. Tickets to this year’s “Diamonds Are Forever” ROAR James Bond gala are $150. Sponsor and corporate tables are available.